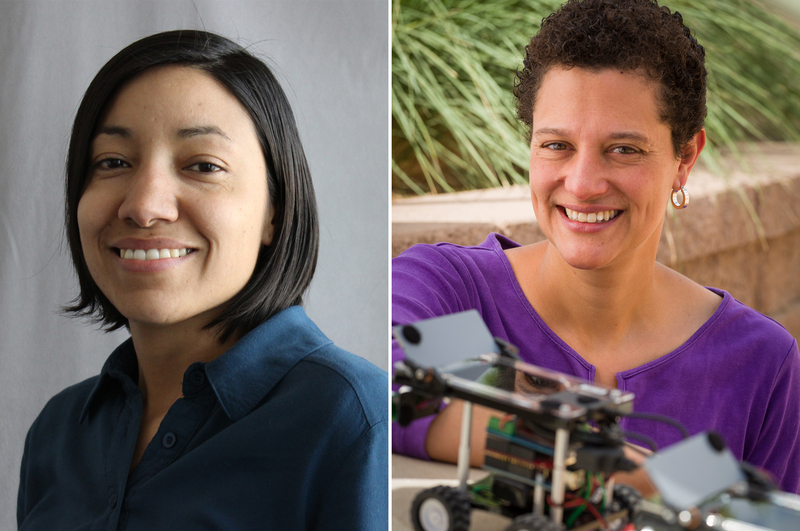 Two professors from The University of New Mexico School of Engineering will be among nine honored by the New Mexico Technology Council as Women in Technology Award winners this month. Melanie Moses, a professor of computer science, and Christina Salas, a faculty member in the Department of Orthopaedics and Rehabilitation in the School of Medicine, and special assistant to the dean for health science center relations for the School of Engineering, are among the honorees. The Women in Technology celebration is New Mexico Technology Council’s event to honor outstanding women in STEM. Nominations are submitted by the public and reviewed by an independent panel of judges. The awards will be given at a breakfast March 28 at the Albuquerque Marriott Pyramid North. In addition to being a faculty member in the Department of Computer Science, Moses has a secondary appointment in UNM’s Department of Biology and an external faculty member at the Santa Fe Institute. She has taken a leading role in developing innovative ways to attract under-represented populations into computer science and engineering. She developed CSforAll, which teaches computer programming to high school students and teachers, as well as college students. CSforAll is the only computer science course (CS 108) at UNM that meets one of the natural science core curriculum requirements. She also developed NASA Swarmathon, which is a swarm robotics challenge in which students from minority-serving institutions develop algorithms for robotics used for space exploration. An annual competition is organized each spring, which this year will be at UNM. Her research is in computational biology and biologically-inspired computation. Salas holds appointments in the Department of Civil, Construction and Environmental Engineering as well as the Department of Mechanical Engineering. She works with Christos Christodoulou, Jim and Ellen King Dean of Engineering and Computing, on leveraging the connections between the School of Engineering and the School of Medicine. She leads a graduate-level biodesign course, which is a joint effort between the two schools, started in 2016. The unique course offers students both engineering and clinical knowledge as each semester, they are charged with developing a product that is designed to meet a specific need in the clinical setting. Students disclose their technology to STC.UNM and submit a provisional patent application to protect their technology. The student teams compete for $50,000 in funding for fabrication, testing, and commercialization of the technology.